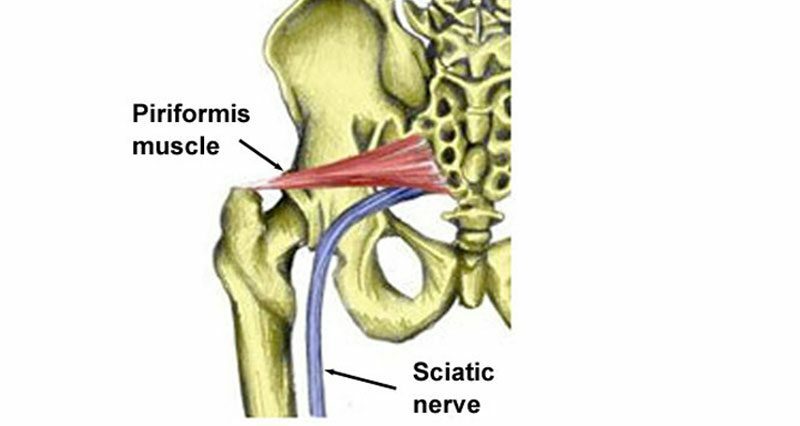 Piriformis syndrome occurs when the sciatic nerve is impinged in the buttock area. This causes pain which radiates down into the leg. 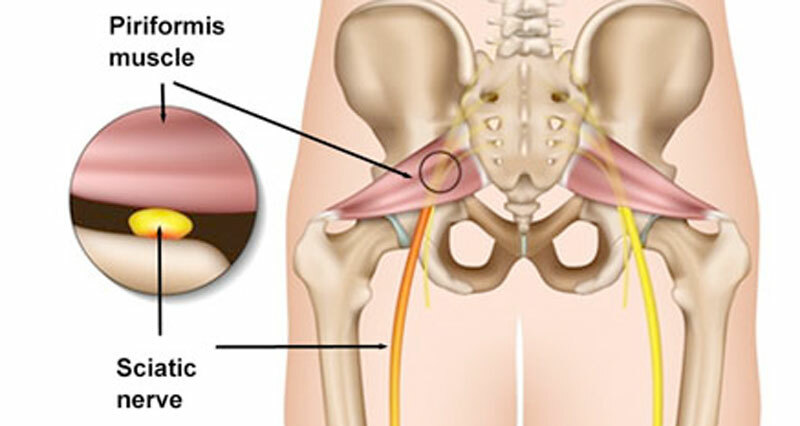 Symptoms of Piriformis syndrome consist of tenderness or pain in the buttock muscle which may radiate down the back of the leg into the hamstring muscles and sometimes even into the calf muscles at the back of the lower leg. Two tests which a professional therapist may use to identify sciatic pain include the straight leg raise test and the slump test. Sometimes people may confuse the pain initially with a hamstring origin tendinopathy. However, there will be no area in the hamstring muscles themselves which is tender to touch. Other signs of Piriformis syndrome include reduced range of motion of the hip joint, especially internal hip rotation (rotating the thigh inwards) is often seen. It is usually overuse which causes the piriformis muscle to go into spasm resulting in pressure on the sciatic nerve. The piriformis muscle is one of the small muscles deep in the buttocks that rotates the leg outwards. It runs from the sacrum bone at the bottom of the spine and attaches to the thigh bone or femur roughly near the outside crease of the buttocks. The sciatic nerve runs very close to this muscle and in around 10% of the population, it actually passes straight through the muscles fibers. If the piriformis muscle becomes tight it can compress the sciatic nerve and cause pain which can radiate down the leg, commonly known as sciatic pain. It has been suggested that this condition would be better referred to as piriformis impingement due to the impingement of the sciatic nerve. A common cause of piriformis syndrome is tight adductor muscles on the inside of the thigh. This means the abductors on the outside cannot work properly and so put more strain on the piriformis muscle. Treatment consists of two phases. 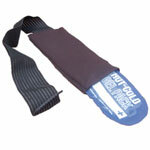 First reducing pain by relaxing the muscle through ice or heat, electrotherapy, massage, and stretching. Then when pain allows strengthening the muscle to help prevent the injury recurring. If Piriformis syndrome is acutely painful or inflamed then applying ice may help reduce muscle spasm. More chronic or longer-term conditions may respond better to heat therapy to relax the muscle however, heat should not be applied if an acute injury, inflammation or recent tear of the muscle is suspected as it will only increase swelling, inflammation, and bleeding. For gradual onset or more chronic conditions, heat in the form of a hot bath or hot water bottle applied for approximately 20 minutes three times a day can help to release the muscle spasm and encourage blood flow through the muscle. Applying heat before performing exercises, particularly stretching exercises may help increase the effectiveness of the exercises. A doctor may prescribe anti-inflammatory medication such as ibuprofen to reduce pain and inflammation. A professional therapist may use sports massage or electrotherapy such as ultrasound to relax the muscle. Light massage at this stage may also be beneficial in releasing muscle spasm in the piriformis. For more stubborn conditions Botox injections may be indicated and occasionally surgery is required. Rest from any activities which make symptoms worse. This is likely to include running and other weight-bearing activities. Gentle piriformis stretching exercises should be done but only if pain allows as this should also reduce the pressure on the nerve causing the pain. Stretches should be held for around 20 seconds and done in sets of 2 to 3, repeated at least three times a day. The aim is to stretch and relax the piriformis muscle so in turn it will reduce pressure on the sciatic nerve and relieve symptoms. Treatment and rehabilitation of piriformis syndrome focus on releasing muscle tension and correcting any muscle imbalances or biomechanical causes which may be contributing to the condition. As soon as comfortable to do so, piriformis syndrome stretches should begin. Hold stretches for 30 seconds and repeat 5 times. Exercises to strengthen the piriformis muscle and other hip muscles can begin. This will help to circulate blood through the muscle and strengthen it so it can cope with the future demands placed on it. Muscle energy techniques are an excellent way of improving the stretch of the muscle. This involves repeatedly contracting and relaxing the muscle whilst it is being stretched by rotating the femur bone inwards. The athlete lies on their front with the knee bent 90 degrees. The therapist gently stretches the piriformis muscle by pushing the foot sideways towards the horizontal (as far as comfortable). The athlete then attempts to contract the piriformis muscle by pulling the leg back towards the horizontal while the therapist resists. This is alternated with the therapist gradually increasing the range of motion at the joint. Using foam roller exercises to target the piriformis muscle can also help release tension in the muscle through myofascial release. One leg is placed across the other to put the muscle on a stretch. The athlete then moves over the roller in a slow and controlled manner working backward and forwards along the length of the muscle. This may be mildly uncomfortable but should not be painful. This can also be done with a field hockey ball or similar. In addition to the specific piriformis stretches it is important to stretch the hamstrings, groin, hip abductors and lower back. Strengthening exercises should be done on a daily basis immediately followed by stretching exercises as the muscle will be more likely to relax into a stretch if it has been worked and warmed up. Some patients may benefit from performing these exercises 3 times a day, especially if in a sedentary job involving long periods of sitting. Strengthening the piriformis muscle itself and also the other hip abductor muscles can be helpful in preventing piriformis syndrome recurring. Clam exercise – Lay on your side, bend the knees and position them forwards so that your feet are in line with your spine. Make sure your top hip is directly on top of the other and your back is straight. Keeping the ankles together, raise the top knee away from the bottom one. Work until you feel the muscle starting to fatigue but do not overdo it especially in the early stages. Slow controlled movements are important. Hip abduction – This involves moving the leg out sideways against resistance. This can be done with an exercise band attached to a fixed object or side lying on the floor using gravity to work against. Build up from 1 easy set to 3 sets of 20 to 30. Hip extension – Position yourself on all fours. Shift your weight slightly off the leg to be worked. Keeping the knee bent, raise the knee off the floor so that the sole of the foot moves towards the ceiling. Slowly lower the leg, almost back to the starting position and repeat. Repeat 15 times initially and gradually build this up to 2 sets of 20. Read more on piriformis syndrome exercises. Deep sports massage techniques can be used to release the tension in the Piriformis muscle. Massage can be applied on alternate days. At the very least two to three sessions at the start of rehabilitation is a good idea. As the condition improves massage can be performed deeper, but the deeper the massage the longer it should be left between sessions as the muscle will need to recover in the same way as it does with heavy strengthening exercises. Once daily tasks are pain-free, a return to activity program can begin. This should be a gradual process. How quickly you progress through the program will depend on the extent of the injury and original fitness levels. It is a good idea to maintain the piriformis specific exercises after full fitness has been achieved to help prevent the injury recurring. An example return to running program is given below. How quickly you progress through the program will depend on the extent of the injury and original fitness levels. This programme should be continued until you reach 15 minutes of solid running. You can then continue to gradually increase as normal, provided there are no symptoms. It is essential that stretching and strengthening are continued throughout the rehabilitation process and beyond.